Sourland Mountain Preserve: A lesson in surrendering. Sourland Mountain Preserve (Hunterdon) is located on Rileyville Rd in Ringoes. Link to map and hike description. To say that my Friday was a bad day might be an understatement. The morning started out so promising and then quickly went downhill. My littlest generously offered my computer a cup of hot coffee which it graciously consumed. Then, just a mere few hours later at my place of employment, my oldest was sitting at my desk very patiently waiting for me. Out of nowhere he slowly fell off my chair, flinging his beverage across the room and covered the desk, printer, filing cabinet, chair and carpet. I stood and stared in disbelief, began to laugh… and then I cried. We try so hard to control our lives, believing that we can be the master of our own future. But sometimes things happen which we don’t expect and we have to abandon our illusion of control. After this office debacle, I decided to surrender to the universe. I relinquished my plans and decided not to push my own agenda. We went into the woods and played and because of this I was only able to take a few photos. We spent most of our hike talking about leaf color, size, shape and textures . The wild boys and I climbed rocks, searched for lichens, discussed the softness of moss and crunched as many leaves as possible under our feet. The Multiflora Rose, Rosa multiflora, has lost most of its leaves revealing its dense thickets of impenetrable fence. Multiflora rose and Green briar, Smilax rotundifolia, were the bane of my fieldwork life. When doing field work for my Masters degree, I bled through my shirts and pants from the thorns of these two plants. Multiflora Rose is non-native while Greenbriar is native, but I really detest both plants. When I see this fence of brambles, I thank goodness that no one is requiring me to walk through them! As much as I don’t enjoy the temperatures becoming colder and the days shorter, I love watching the forest preparing for its winter slumber. The plants are dropping their leaves and tucking in the forest floor until the days start to lengthen again and the ground begins to thaw. Witch Hazel, Hamamelis virginiana, in bloom. I love this pretty shrub with such wild- looking flowers! They possess a somewhat inconspicuous quality as they blend in with the Fall colors. Yet, they are one of the most outrageous flowers in the woods and so fantastical with their party-streamer like petals. I am always on the hunt for these unique beauties in Autumn. When we finished our hike, we made a pile of the leaves we collected in the woods. Rough leaves, smooth leaves, big leaves, small leaves, yellow/green/red/orange/brown and even polka-dotted leaves! Children love to play games, so we played “I spy” and looked for red leaves, then big leaves, then pointy leaves and so on. My littlest is on the young side for some of the adjectives I gave to my oldest, but he did happily participate with color and size prompts. Children learn through direct experience with Nature and being able to work on shapes and colors while outside is a double bonus. I love taking my boys out on hikes not just for the exercise (and post-hike naps!) but also because they explore and use their imaginations. My oldest decided that he was a mountain lion and ran and roared at the top of his lungs. My littlest copied his brother but also went off on his own exploration. I am happy to report that this hike lifted my spirits and restored me to a place of well-being. Even though this morning seemed like a complete and utter disaster, at the end of the day we were all healthy and safe. What more could I ask for? This entry was posted in Uncategorized on October 30, 2018 by Carolyn. Baldpate Mountain – An unintentionally long hike with friends! Walking in the woods is a wonderful way to relax, exercise, think and catch up with friends! Recently, two of my friends were off from work on a Monday so they each drove 45 minutes to come join me on one of my blog hikes! I was so delighted to have their company and to share Baldpate Mountain with them. Baldpate is one of my favorite places to hike in this area. I have spent so much time in these woods that it almost feels like my own backyard. Even though I am very familiar with the preserve, I still discover new and fun things. I warned my friends that I got lost here once when I was hiking around with another friend. I thought that I knew where I was going, but I clearly had no idea. My friends said they trusted me and so we took off. Well… needless to say, I went down a trail I thought I was familiar with, but apparently I was not. I led them 1.5 miles down a trail that I had never been on before. I then realized that we were headed in exactly the opposite direction than I had planned to traverse. While this new area was really cool and I discovered a lot of new geology and ruins, it was way past lunch time and we were famished! Our hungry bellies propelled us at amazing speeds and we hiked out of the preserve much faster than when we hiked in! This post is possible because of a community of naturalists! I reached out to quite a few people to help me because I encountered so many “New-To-Me” organisms and I had no clue where to begin. I asked Pat Coleman for help when I couldn’t identify a plant down to species. I reached out to my favorite Lichenologist, Dr. Natalie Howe for help with identifying the lichens we found. The ever generous Nina Berghardt identified our mushrooms and gave us some super cool information. I also asked Paul Kurtz of the NJ Department Of Agriculture for help with identifying an insect and egg mass that we found and he provided some really interesting information. Thank you Natalie, Nina and Paul for your help and Knowledge! All of these wonderful people have given talks or have lead hikes for the Sourland Conservancy. They have volunteered their time and their expertise and I am very grateful to them for helping me learn more about the amazing Sourland Mountain region. The Sourland Conservancy has a wonderful community of passionate, intelligent and caring members and volunteers who devote an incredible amount of time and energy to the protection of the Sourlands. I can’t go to Baldpate without checking out the Chestnuts! This is a Chinese Chestnut, Castanea mollissima. I am surprised that they aren’t called “Land Urchins”! I was hoping to find some ripe chestnuts but all of the ripe ones had been eaten and the ones that were on the ground and not eaten were also not ripe. Maybe one day! I think this is Wreath Goldenrod, Solidago caesia. I have seen this goldenrod at so many different research projects and sites but I had never identified it. I just always called it “Solidago flowers in axils” (Solidago canadensis, the more common species has terminal flowers). One of the great pleasures I have in my current position is that I (now) have the time to identify particular species which I previously had to leave as “unknown”. When collecting field data, we usually try to maximize the amount of species identified within a limited time-frame. This often leads to assigning an “unknown species” a number or code, and continually identifying that “unknown” by its number, rather than by its latin name. Now that I can go out and identify plants at my leisure, it allows me the extra time to spend and try to figure out what the plant names really are. Common Blue Wood Aster, Symphyotrichum cordifolium. This is another species that I have seen so many times and only identified it as “Aster spp.”. This flower is so lovely and I love seeing it peaking out in the woods. I sent this funky mushroom looking thing to Nina and she told me that this is actually two mushrooms. The honey mushroom Amillaria is being attacked by Entoloma abortivum. The result is an edible mushroom that resembles sweet bread. When you see these marshmallows type things, look around for a white mushroom with grayish gills. These white mushrooms turn pinkish due to their pink spores. I read more about these mushrooms and I discovered that there are many Poisonous Species of Entoloma. I know I have said it many times before but I will say it again: Do NOT EAT any mushrooms unless you are 100% sure what it is! As my friend said while we were out on our hike, “Everything is edible, ONCE”. Linden Viburnum, Viburnum dilatatum, berries. This is an invasive species of viburnum. I’m sure this plant was brought over because of their beautiful red berries but it has since escaped and now I see it everywhere in the Sourlands. An egg mass from some sort of Gall wasp. We didn’t know what species, but this was too cool of a picture not to post! My friend, Dr. Natalie Howe, is a Lichenologist and she is probably one of the most enthusiastic people I have ever met. She is just wonderful! She recently gave an engaging and fascinating talk at the Sourland Conservancy‘s Train Station Seminars on “Lichens of the Sourlands”. After her talk, I became really excited about searching for Lichens in the Sourlands. 26% of lichens in Mercer County (and probably the Sourlands) are foliose. 3% of lichens in Mercer County (and probably the Sourlands) are fruticose. A log covered in moss. In the background you can see what looks like a little forest of brown “sticks”. Those sticks are called “setae” and they hold up the sporophytes. Mosses do not produce seeds. Instead, they produce spores which are contained within the sporophytes. Coral fungus, Ramariopsis kunzei. This little one was about the size of a silver dollar and just looked so cute and perfect! Pat Coleman helped me identify this Clearweed, Pilea pumila. While we were out hiking, we decided it was a nettle of some sort. Then I “bravely” (or perhaps, “stupidly”) volunteered to see if it was really stinging nettles. Luckily, it was not! I was completely stumped in this identification because it clearly looked like a nettle but did not sting like one. Pat told me that this Clearweed is in the same family as nettles but minus the sting. While we were walking along and chatting, I saw this out of the corner of my eye and whipped around shouting “WHAT IN THE WORLD IS THAT? !” I nearly caused a three-person pile up with my sudden stop but it was worth the near collision. This happens to be a Walking Stick Insect which has been attacked by the fungus, Beauveria bassiana. I brought this picture to the Sourland Conservancy’s Train Station Seminar on “The Spotted Lantern Fly” and I asked the presenter, Paul Kurtz, if he knew what may have happened to the insect. He told me that Beauveria bassiana is a naturally occurring soil fungus which is entomopathogenic. Many soil insects are immune to this fungus, but most foliar (leaf living) insects are not. This Walking Stick could have picked up the fungus if it had been on the ground and then succumbed to the fungus. There is presently a lot of research concerning the use of this fungus as an organic pesticide. You can read more about it here. I finally found a Turkey Tail, Trametes vericolor!!! When we saw this, I was very excited because, up until this point, we had only found False Turkey Tails. I mean, this looks exactly like an actual turkey’s tail. As my friend pointed out, Turkey Tail has scalloped edges whereas False Turkey Tail does not. I love exploring with other people because we all see different organisms and patterns and it makes it so much more fun to learn with each other. Hen of the woods, Grifola frondosa. My friends spotted this big, beautiful mushroom while I was off in la-la land trying to figure out our present location. Obviously, being in la-la land was most likely the reason why I got us lost in the first place. I own a couple of chickens and this mushroom does remind me of their fluffy bottoms. When I first heard of the name “Hen of the Woods”, I immediately thought “Chicken of the Woods” but I knew that I must be confused. Again, this is a great reason to always learn the latin names of organisms. Then, you will always know for sure what someone is talking about! Mile-a-Mile, Polygonum perfoliatum, berries! I had never seen the berries of this plant before and was amazed at how beautiful they are. I spied the berries first and ran towards them. My initial squeals of excitement were quickly followed by groans when I realized to whom the berries belonged. Leopard Slug, Limax maximus. This critter was enormous and almost the length of my hand! These woodland mushrooms, Lycoperdon perlatum, are quite risqué in their attire 😉 . Ground cherry, Physalis spp., husk. It is possible to see so many beautiful things in nature if you only slow down for a a moment and take a look! This entry was posted in Uncategorized on October 20, 2018 by Carolyn. Link to map and hiking information. It was a beautiful sunny Saturday morning and my husband and I decided it was a good day for a hike. I have actually never hiked in the Sourlands on the weekend. I always go on hikes on weekday mornings so I was completely surprised to see a PACKED parking lot! In all the years I have been hiking these trails, I may see a few cars in the parking lot but never anything like this! At first we thought about maybe going to a different preserve that wasn’t so crowded, but decided to head into the woods anyway. I am so happy we did! Even though the parking lot was crowded, the woods were not crowded at all. We saw people maybe every 15 minutes or so, but it never felt like it was crowded. This rain has just been doing wonders for the forest fungi! There were so many mushrooms, so I need to say a big THANK YOU to Nina for being wonderful and answering all my mushroom questions! Hopping like a frog from rock to rock! This was another new-to-me plant! I reached out to the trusty Sourland Stewards and they were able to ID this plant. I know that I have said this before, but they are such a wonderful resource for all your stewardship needs! This native vine is Moonseed, Menispermum canadense. Moonseed is named for its crescent shaped seeds. This was another new-to-me plant! Black Snakeroot, Sanicula canadensis. This native plant attracts bee pollinators and apparently is unpalatable to deer! My kids really enjoyed running over all the bridges in the forest. I thought to myself as I took this picture, “I know there is something interesting about Daddy-long-legs but I can’t remember exactly what it is… Well, this arachnid is not a spider. Taxonomy identifies classifications of organisms according to Kingdom, Phylum, Class, Order, Family, Genus, and species. Spiders and Daddy-long-legs are both in the Class Arachnida, but spiders belong to the Order of Araneae and Daddy-long-legs belong to the Order of Opiliones. Daddy-long-legs do not have fangs or venom while spiders most certainly do!. I find these differences and similarities absolutely fascinating. You can read more about it here! My wildboys (and husband) running through the woods. A waxy cap, Hygrocybe (H. conica or H. acutoconica). These species of Hygrocybe often appear late in the season. I saw a lot of these mushrooms on this hike. Another non-native red berry! Burning bush (Winged Euonymus), Euonymus alatus. Burning bush was originally used as an ornamental, but has escaped from our lawns and has invaded our forests. Evidence of a forest snail. Truth be told, I had never seen a forest snail until a few years ago. I was on Baldpate Mountain and picked up a snail shell and was completely shocked. I am not sure why I was so surprised, but I suppose I had always thought of a snail as an aquatic animal. There are many species of terrestrial snails and depending on their species, will eat plant matter and fungi or even prey on nematodes. Can you imagine watching a snail stalk its prey? Pretty wild! A Gilled Bolete, Phylloporus rhodoxanthus. Apparently the cap will turn blue if you pour ammonia on it. Read more about Gilled Boletes here! I forgot to ask Nina about this mushroom, so I will take a stab at identifying it… I think this is a Mycena galericulata. Honestly, I really don’t know too much about identifying mushrooms but I always get so excited when I find them! I need to go out on more mushroom forays to learn. Musclewood, Carpinus caroliniana. This tree gets its common name from the sinewy look of its bark. I love these trees and I can never keep myself from running my hands along their trunks. Another waxy cap, Hygrocybe miniata. It was so small and dainty I almost missed seeing it! A coral fungus, Ramariopsis kunzei. These fungi can look pretty wild as they grow larger. White Turtlehead, Chelone glabra, a beautiful native. Yet another new-to-me! Truly, how wonderful to walk through this world and learn something new each time! A millipede! I tried to figure out which type of millipede this is, but I couldn’t quite decide on a specific identification. What’s the difference between a centipede and a millipede? A hundredth to a thousandth! If you don’t find my puns amusing, you can read more about the difference here! A Leopard Earthball, Scleroderma areolatum. Nina told me to “note how each small scale is encircled by a clear area (areola)”. I thought this was such a cool little find! I saw it on our way out of the woods. One of the fun things about an out-and-back hike is that you see all the things you missed on your way in! More red berries! False Solomon’s Seal, Maianthemum racemosum, berries! More black berries! Solomon’s Seal, Polygonatum spp., in fruit! I think this is Smooth Solomon’s Seal, Polygonatum biflorum, but the plant is in rough shape and my toddlers were tired so I didn’t spend too much time trying to identify it down to its species. My heart was bursting while out on this hike with my family. My wild boys were running, shouting and exploring and my husband and I were in awe of how much they have grown. I love watching the children pick up acorns, rocks, leaves and sticks and inspect them while thinking about their next move. Sometimes, it’s an object to throw or it’s a tool or it may be a coveted treasure to be carried for the whole journey. As we walked down the mountain, I held my oldest son’s hand. I asked him if he had a nice morning and he shouted a resounding “Yes!”. I then said, “I love you so much” and my three-year old responded “I love you so much too, Mom. We love each other the same”. This entry was posted in Uncategorized on October 7, 2018 by Carolyn. 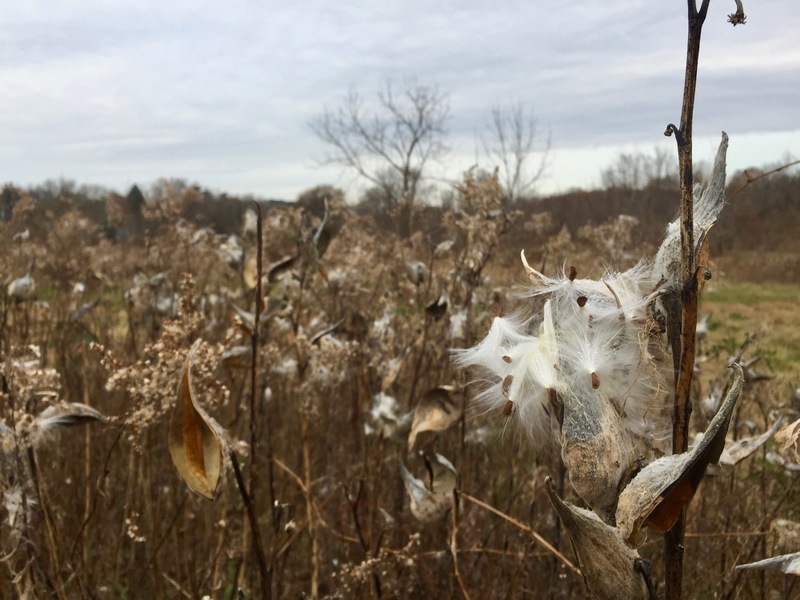 Sourland Ecosystem Preserve – A wonderful way to welcome a new week. The Sourland Ecosystem Preserve is located on Mountain Rd in Hopewell. Link to map and trail description. Mondays are generally viewed as the most “blah” day of the week although I actually think Sunday evenings are even more “blah”. Getting up early, packing lunches, driving to school and work… I mean… I get it. However, I love Mondays because it is hike day! I know that not everyone is so fortunate as to have a job which requires them to enter the woods and lose themselves there each week. All this rain has provoked a proliferation of fabulous mushrooms! I have seen more mushrooms this week than I think I have seen all year! Red ones, yellow ones, puffballs and corals! I have had a hard time containing my excitement! I reached out to Nina for identification help. As always, she came through for me and has provided some interesting information about these mushrooms. Thank you, Nina! Chicken of the Wood, Laetiporus sulphureus! I have been on a hunt for one of these ever since I learned about people foraging for mushrooms. I spotted it about 50 yards away from me and I zeroed in. You can read more about Chicken of the Wood here! You can read more about other edible mushrooms here! Here is my usual disclaimer: DO NOT EAT anything unless you are 100% sure that you have identified it correctly and especially, do not eat Mushrooms!!!! Even though I was pretty confident that this mushroom was Chicken of the Wood, I still asked an expert for confirmation of my identification. The majestic American Chestnut, Castanea dentata! I don’t think I can tell you how much I love this tree and I have never even seen a mature one! The history of this tree is fraught with tragedy and love. American Chestnut is in the same family as Oaks and Beeches (Fagaceae). When you look at the leaves, you can see its resemblance to red oaks and beeches and the fruits of these trees hold some similarities. Ahhh.. graduate school… It was such a dark hole but also such a wonderful opportunity to learn! Evidence of Chestnut Blight, Cryphonectria parasitica. I am going to put in another excerpt from my paper! Here goes! introduced to the United States from imported Japanese Chestnuts, in the late 1800s. In 1904, the blight was identified in New York City at the Bronx Zoo. Within 50 years of C. parasitica’s identification, it spread through almost the entire range of C. dentata. C. parasitica spread at an approximate rate of 37km per year, and had spread from across C. dentata’s native range, killing 4 billion American Chestnuts within a 50 year timespan. OK, I know that was very nerdy but honestly, this is the type of topics which propelled me through graduate school. I am so utterly fascinated by what happened to the Chestnut and what researchers at the American Chestnut Foundation are doing to bring this giant back! On October 12, my good friend and I will be giving a talk about the American Chestnut and playing some music at a fundraiser for a American Chestnut restoration project in New Jersey. If you have any interest in coming or donating, here is a link to check out! Exidia recisa, a jelly fungus. I have recently learned that many fungi and lichen do not have common names because, as my good friend Natalie said, “They are not commonly talked about”. You will find fungi and working hard decomposing dead wood. Goldenrod, Solidago spp. I am not sure what species this is because I have not seen a species quite like this Goldenrod before. I was going to skip posting it because I didn’t know what it was . I asked a few botanist friends and there (they) weren’t sure either. I decided to “crowd source” an answer! If you know what species this is, please let me know! False Turkey Tail, Stereum ostrea. This mushroom is a saprophtye, which means it lives on dead or decaying organic material. Boogie-Woogie-Aphid, Grylloprociphilus imbricator, on an American Beech, Fagus grandifolia. Another common name for this aphid is the Beech Blight Aphid. As you can clearly see, the Boogie-Woogie-Aphid is a far superior name. I first noticed these aphids a couple of years ago while walking through Heylar woods in North Brunswick. They are the funkiest aphids I have ever seen. When they feel threatened, they wave their rear ends in the air (**singing in my head** like they just don’t care). Aphids are sap suckers and from what I have seen, these tiny dancers don’t cause significant damage to the beech trees. Sometimes, the “honeydew” (a cute name for poop) from the aphids can grow a sooty mold fungus known as Ascomycete. This fungus does not hurt the tree but it is unsightly. Here is a funny and interesting article from Scientific American about the Boogie-Woogie-Aphid. This mushroom belongs to the genus Russula. There are many species of Russula and they can be very bright and colorful or dark like this one. You can read more about Russulas here! Wolf-far Puffball, Lycoperdon perlatum. Could there be a better common name???? Excuse me while I continue to cackle out loud while sitting at my desk! I was going to write more about this mushroom, but I can’t because I keep laughing. Read more about it here. A marbled orb weaver, Araneus marmoreus. This little one got me by surprise! I was inspecting some flowers and then I saw it drop and for a split millisecond and I thought it was a crab! Why a crab? Well the abdomen was really round… it moved really fast… I don’t know why I thought “crab” but I did! I have never seen a spider like this before! This fungi was too rotten to identify, but I still think it looks really cool. I love all the different textures and colors. A brown hooded owlet moth caterpillar, Cucullia convexipennis. The caterpillars eat Asters and Solidago (seen here). I am not sure why it is called an Owlet moth, but you can see more pictures here! This mushroom is in the genus, Lactarius. Latin names often have a wonderful way of clueing us in to something particular about the organism. In this case, mushrooms in the genus of Lactarius, lactate! These mushrooms will release a latex substance when damaged. Read more about Lactarius here! Great Blue Lobelia, Lobelia siphilitica. I couldn’t capture the blue of the flower petals. There was another specimen, but it looked a little worse for wear so I went with the one pictured. This was yet another new-to-me plant. I love that no matter how many plants I learn about, there will always be more to learn! Here is your fun fact for the day! The species name, siphilitica, is from the word “Syphilis” because it was thought to be a cure for it. This entry was posted in Uncategorized on October 4, 2018 by Carolyn. Dry Creek Run – Autumn berries abound! Dry Creek Run is located on Brunswick Pike in Lambertville and shares the same parking lot as Rock Hopper Trail. Link to map and more hiking information. It has been raining buckets these past few days and the funky, earthy smell of decaying plant material is very much present. I actually find this smell pleasant and comforting while I also know that others find it an offense to their olfactory sensors. After I started walking, I noticed a bunch of red berries – half native and half non-native. I think it’s important to know that the nutritional value of berries is not the same across all plant species and these differences can greatly impact migratory birds. Non-native berries typically have a higher carbohydrate content than native plants while berries from native plants are generally higher in protein /fats. Carbohydrates make birds satiated and give them a burst of energy. However, proteins/fats provide birds with sustained energy for longer periods of time, thus making berries from native plants ideal for migration. Read more about that here! I was really hoping to get a picture of some ripe Spicebush, Lindera benzoin, berries because they are bright red and would be perfect for the forthcoming series of native vs non-native berries but unfortunately, I did not see any Spicebush berries. Here is my disclaimer… I am not an expert in edible plants and PLEASE DO NOT EAT any part of any plant unless you are absolutely sure of your ability to correctly identify the plant). There are some plants that are extremely toxic and yes, can cause death following consumption. Poisonous berries, leaves, stems and roots exist in nature. But there are also many plants that are also perfectly wonderful and safe to eat. However, PLEASE DO NOT EAT any part of a plant unless you are absolutely sure you have correctly identified it as something safe to eat. Native: Jack-in-the-Pulpit, Arisaema triphyllum. Jack-in-the-pulpit is one of my favorite forest finds ( and I have many favorites). I always get excited when I see those pitchers! Even though these berries look enticing, leave them for the birds and forest animals. They are not edible! Non-native: Autum Olive, Elaeagnus umbellata. A former co-worker of mine makes the most delicious autumn olive cheesecake. She is a fabulous cook! I also like eating these berries raw. They remind me of a tart cherry of sorts. There are a lot of red berries in the fall, so please always make sure you know for certain what you type of berry you are about to consume. Non-native: Multiflora Rose, Rosa multiflora, rose hips. I wonder why they are called “hips” instead of berries? Anyways, apparently they are edible. I have never tried one, but you can read more about eating them here! Non-native: Japanese Barberry, Berberis thunbergii. These non-native berries look an awful like native Spicebush, Lindera benzoin, berries to me in both shape and size. The plants look totally different, but the berries are similar. Supposedly, the berries are “edible” but they are very bitter and tart. Personally, I think you should just rip the whole plant out and call it a day 😉 If you want more information about eating Japanese Barberry, here is a link. Native: Flowering Dogwood, Cornus florida. I don’t know why I didn’t remember this tree has red fruit. I saw the fruit out of the corner of my eye and (was like) thought, “hmmm… looks like a dogwood but it must be a Kousa dogwood, Cornus kousa” (which, by the way, has very tasty fruit and is non-native). I was completely surprised to see that this was the native dogwood and was very impressed by the size and color of the fruit! Flowering dogwood fruit is not edible and is considered toxic in large enough quantities. So leave this one for the birds! Native: Blackhaw, Viburnum prunifolium, unripened fruit. These fruits will turn red then turn to black when fully ripe. I read that these fruits are edible fresh and can also be turned into preserves/jams. I also read that an overdose from this plant causing nausea, dizziness and seizures… I couldn’t find any information which quantifies the amount that would make someone “overdose”. So you should read more about it and make that decision for yourself! On a side note, the fall foliage is a beautiful red and would make a great accent plant to any landscape! Non-native: Common Privet, Ligustrum vulgare, these fruit will also turn black when ripe. Privet fruits are toxic to humans so please leave these berries for the woodland animals! American Basswood, Tilia americana, a native tree with very interesting looking fruit. The fruit are drupes that have a bract (modified leaf part) attached to them. My assumption is that this bract helps with seed which functions as a sail for the fruit. More importantly, I discovered that young Basswood fruit has been used as a substitute for chocolate! I am so excited about this new information and wish I had known that when I was out hiking because this tree had fruit on it! I will undoubtedly be searching for Basswood on my next hike and will taste some of the berries! Smartweed/Tearthumb, Polygonum sagittatum, an invasive with teeny tiny recurved thorns that definitely “tear your thumb”! Ouch! The bleeding Mycena, Mycena haematopus. I reached out to the awesome Nina Burghardt for mushroom identification help and she not only identified the mushroom I found but she also provided some cool information about Mycena haematopus. Mycena haematopus have a bell-shaped cap (campanulate) and are fragile. They supposedly release a purplish red juice when cut. I wish I had known this before my hike because I would have given it a try! Mycena helps to decompose wood and leaves, which contain cellulose and lignin. Cellulose and lignin are the most difficult components in plant material to break down. The role fungi play in nutrient cycle is vitally important . This entry was posted in Uncategorized on October 1, 2018 by Carolyn.